Lebanon has yet to seriously address the issue of thousands of people who went missing or were forcibly disappeared during the country’s civil war. While most are assumed dead, activists believe some may still be alive and currently detained in Syrian prisons. 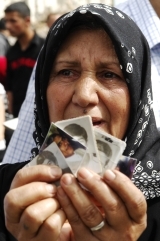 A recent initiative taken by the families of the missing and civil society organizations in Lebanon led to the finalization of a draft law titled “Law on the Missing and Forcibly Disappeared Persons.” The law would establish an independent commission to investigate what happened to those who disappeared and identify the locations of mass graves. The families have planned a lobbying campaign targeting civil society, parliamentarians, and other government officials to urge the passage of the bill. In support of their efforts, ICTJ held a two-day roundtable discussion on draft law, co-organized with the Committee of the Families of the Kidnapped and Disappeared in Lebanon, Support of Lebanese in Detention and Exile (SOLIDE), and Act for the Disappeared. Following the discussion we sat down with Wadad Halwani, president of the Committee of Families of the Persons Kidnapped or Disappeared in Lebanon, and Ghazi Aad, co-founder and president of Support of Lebanese in Detention and Exile (SOLIDE) to further explore the implications of the draft law. To Wadad Halwani: Can you share with us your perspective on this draft law? What are the families’ expectations for the law, and will these expectations be met? Wadad Halwani: It is very important that this draft law has seen the light. This issue is personally important to me as well; my husband was kidnapped in 1982, the year the Committee of Families of the Kidnapped and Disappeared was founded. However, I cannot say I am optimistic that this is close to being resolved. We as a committee spent 18 years making demands and holding demonstrations and strikes before we achieved recognition from officials that this is even an issue. "We will not give up this fight as long as we are armed with the right to truth and with our hope." But that is not to say the draft law is not a critical step. We worked on this law with the assistance of a number of judges, lawyer Nizar Saghieh, and with the help and direct supervision of ICTJ, which suggests it is a comprehensive mechanism for resolving the issue of the missing. We, the victims—since the victims are not only the missing but their families as well—helped create a legal mechanism to finally resolve the issue and we will do our best to ensure the bill passes. Had we lacked hope throughout this long journey of almost 30 years, we would have become frustrated, stayed home, and abandoned the cause. We would have listened to the politicians who said that the issue died with the war. But even though they took our loved ones, nobody can take our hope. We will push forward until we achieve the truth. What has impeded any action to address this matter before now? How will the lobbying process try to overcome the political interests counter to the draft law? Halwani: What has prevented an examination of the fate of the missing until today can be summed up in one phrase: the absence of political will among Lebanese authorities. This unwillingness to address the issue is reinforced by the fact that most of the perpetrators and former war leaders are still publically or politically active and have full immunity. They were not prosecuted or even questioned. We are searching for a human being that has a name, is of flesh and blood, and has a family. We will not give up this fight as long as we are armed with the right to truth and with our hope. This cause is not only a political but a national one. We will continue to push the government—with the support of civil society organizations and individuals from all social and political fields—to shoulder its responsibility to fulfill the right to the truth. To Ghazi Aad: How many Lebanese people remain missing to this day, and how many of them are still believed to be alive? Ghazi Aad: The official number of the missing acknowledged by the Lebanese state is 17,415 people. To determine the number of those still alive, we have to examine who the parties responsible for the enforced disappearances were. Lebanese militias disappeared the largest number of people during the war. The regional powers that were present in Lebanon during the war—Syria, Israel, and the Palestinian Liberation Organization (PLO)—are also responsible. "There is the possibility that there are forcibly disappeared people alive as detainees in Syria." There is the possibility that there are forcibly disappeared people alive as detainees in Syria. Lebanese militias, on the other hand, admitted they do not have missing persons which means they are all dead. When we talk about revealing their fate we mean finding their remains, where they were killed, and how. Given the current situation in Syria, will it be possible to determine the fate of the Lebanese who are believed to be detained in Syria? Aad: We have definitive information on the presence of Lebanese who were taken to Syrian prisons. The problem today is that Syria does not admit this happened because it was arbitrary detention. These prisoners were tried before Syrian courts and we do not know what kind of accusations they faced or what verdicts were brought against them, if any. Since the Syrian authorities do not admit their detention or existence and has not revealed their fate and whereabouts, they have become victims of enforced disappearance. "We are very worried about the fate of those who might still be alive." We are very worried about the fate of those who might still be alive amidst the current events in Syria because we have seen what happened in prisons in similar events in Egypt and Tunisia. The recent violence in Syria has downgraded the issue and made it more difficult to promote discussion. It is thus our responsibility to pressure the Lebanese government to shoulder its responsibility to reveal the fate of Lebanese who were detained by Syrian forces and transferred out of the country. How does the draft law address the matter of those believed to be detained in Syria? Aad: The draft law does not directly address the issue of the detainees in Syria and the struggle of their families. One of its articles does tackle the issue of the forcibly disappeared, which refers to the forcibly disappeared in Lebanon or Syria or anywhere else. We would have preferred a direct mention but the law is still a draft and can be further amended. We are working to improve it, to include the families’ struggle and how to learn the fate of their sons in Syrian prisons. Transcript adapted from interview conducted in Arabic.